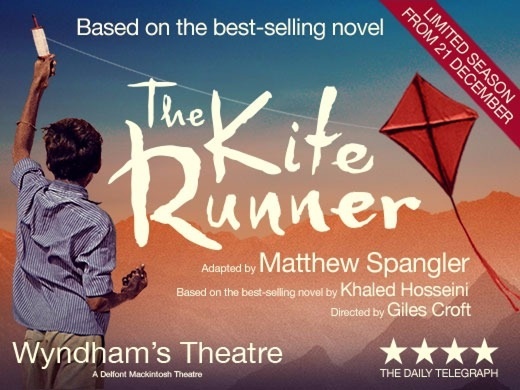 Adapted from Khaled Hosseini’s international best-selling novel, The Kite Runner is a stunning stage production which tells the story of a friendship spanning cultures and continents and follows the haunting journey of a man in search of redemption. Afghanistan is divided, on the verge of war. It’s a beautiful afternoon in Kabul and the skies are decorated with the excitement and joy of a kite flying tournament. Childhood friends Hassan and Amir are about to be torn apart, but neither can foresee the terrifying incident which will shatter their lives forever. Following successful runs across the country, The Kite Runner comes to the Wyndham’s Theatre this December for a strictly limited season. The play was so well done that we couldn't take our eyes off the stage. I was amazed at how I could get so engrossed into the kite flying competition . It was quite sad and emotional in places but moved along quickly so did nit make the sadness linger. Thankfully a good ending. All thr actors were brilliant especially Amir and Hassan. Definitely recommend it. We highly recommend the play to everyone. We thoroughly enjoyed it, the storyline was as close to the book as possible in a play and even though my partner had not read the book and knew nothing about the story, he thought it was coherent, and more importantly gripping and insightful. I changed from laughing out loud to shedding tears, it surely was an emotional experience. This story is for everyone! I have read the book and thought this a wonderful story. However I found the narrator overly dramatic bordering on cheesy at most times. The set was not as imaginative as it could have been to hold the audiences attention, especially considering it was a monologue for most of the play. However the music and the overall acting was very good. If you did't read the story, you will love it. The details, the story tilling was brilliant. Touching and bearthtaking. It was an amazing show. The acting was powerful and the lighting and set very clever. Fantastic show and lead actor was excellent , its a shame its on for such a short time as I would recommend to friends and family . Excellent performance, especially the main actor! He was amazing. Incredible. Very well narrated by the lead role! Amazing, gripping, beautiful performance that left me with tears streaming down my face. Absolutely loved up to the book. Am so glad I was able to see it! The actors were amazing and really brought the story to life. Each character was portrayed really well and the uncomfortable and sad setting of the story was brought out so well. 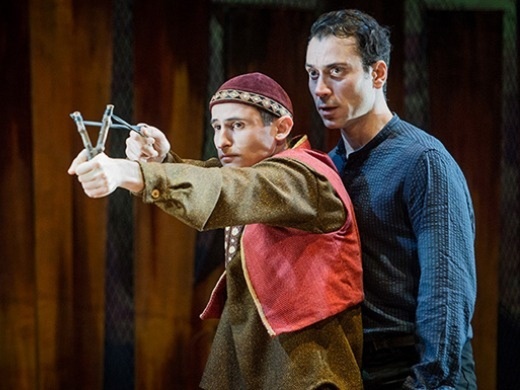 The Kite Runner was very impressive. Strong plot and good acting from everyone in the cast. Believable performance, I enjoyed the style of acting/ theatre. The set was simple but effective. I wasn't too sure about the main actor's American accent though. The character is not American so it was unnecessary. However, overall it was a great piece of theatre; one of the best I have seen in the West End, the kind of performance that has you leaving the theatre smiling and commenting on how much you enjoyed it. Well done to everyone involved. This is by far the best play I have seen in London West End and trust me I have seen most of them. Very emotional and intense. Awesome acting by Ben Turner and Andrei Costin . A standing ovation a must see. Really enjoyed the Kite Runner. Made me want to read all three books again. An amazing experience. Very absorbing and highly charged play. Actors told this traumatic emotional tale with twists and turns very well. 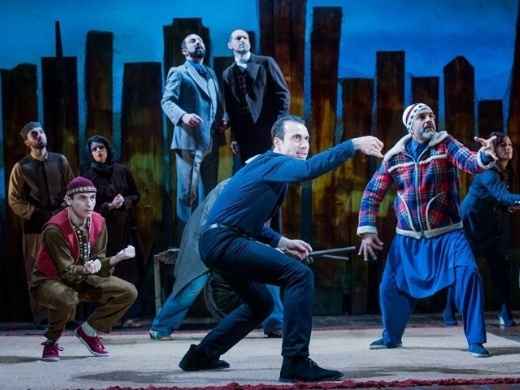 Aside from taking the authenticity of the culture away by having performers of non-Afghan backgrounds, and heavy Dari accents to the point of incomprehensible dialogue, this show also included the main character reciting the Shahada multiple times and prostrating in the direction of the audience, rather than the Mecca. This is highly inappropriate in Islam and I found it very offensive, despite not being a muslim myself. I can only imagine what an muslim audience's reaction would have been had they been the predominant viewers that day, which was not the case. The fake English accents put on to portray how an Afghan would speak English was also highly inaccurate , inappropriate, and redundant. An incredible, captivating play which was every bit as wonderful as the book. Left the theatre in tears. Very emotional and perfectly delivered by a superb cast. One of the best plays I've ever seen. Truly fantastic. Powerful, engaging production of a heartbreaking story. Sit near the stage to get the most of the atmosphere. I cannot express just how disappointed i was after watching this show. It was a monologue played by and adult version of Amir, which was fair enough, but then Amir was in the same outfit the whole time (a black casual shirt and slim black jeans). From time to time while Amir was presenting the dialogue (which he actually just read the whole book out) he would change into the character of the 'child hood' Amir, where he was still dressed in the same clothing! His acting was so poor, he could not change into the 'child' that he wanted to. The cast was so small therefore some characters had to play 2/3 roles, however they didn't get given a change of outfit! Flabagasted is the only word to describe what I thought of it. There were no props, there was no microphones used, lighting was very limited. Having previously read the book and watched the movie I was very pleasantly surprised at how much I enjoyed this show. Wonderful interpretation, very well acted and absorbing throughout, I would highly recommend you take the opportunity to experience this show. Superb cast. Very intense, well told dramatisation. Everything I'd hoped for. Beautiful theatre. Stunning performance from every member of the cast. A brilliant, brilliant performance. A must watch. Congratulations to all members of the productions team! Great play, really enjoyed it, but very emotional at times! Fab show, a credit to the amazing book. Probably the best and most moving piece of theatre I have ever seen. It will stay in my memory for along time. Thanks to all those that took part and gave of their best. Absorbing from the start off. Incredible acting, so moving. The stage setting so simple but so very effective. The time just flew by and I don't think there was so much as a rustle of paper or a cough from the audience, so involved were they in the play The tamba player was incredible too. really added atmosphere and drama to the setting. I had never seen this instrument before and was amazed at the variety of sounds that the player elicited from it. I was in London on business and decided to take in some culture one evening. What an amazing performance. The acting was incredible and so on point. I knew the story having read the book and watched the movie. Seeing it come to life on stage however brought it to a whole other level. Highly recommend! Fantastic show, really believed the characters, very emotional and extremely well done! Perfect casting for the characters. Strong storyline, performed very well. The show made me smile, laugh and cry. Would recommend. I enjoyed this play very much. I have read the book and the play brought it to life in such a moving and beautiful way. An outstandng performance. We were on the edge of our seats from beginning to end. Having read the book, I felt the story was well covered theatrically. The actors were great- not huge props, not much music, not amazingly outstanding costumes...it was all about the acting and performance. Well done. We really enjoyed it and wont forget it in a hurry. It was absolutely stunning. Even though I had read the book and knew the story, the performance still managed to give me so many emotions and made me cry. The actors are simply incredible, it's a play that everyone should see! You must see this production before it finishes on March 11th. Cried three times before half time. What a great experience it was!! The play was amazing! Had fantastic time! Thank you ! It was brilliant. I went with my sister in law and niece We all thought it was one of the best plays we had ever seen. Had you sitting on the edge of your seat! Fantastic performances. The actors inhabited those characters, made them totally believable and made me feel every single emotion with them. The pain of guilt, the power of loving devotion, the frustration and tension between doing what's right and what actually works - pragmatism over principle and then the ultimate victory of principle makes this a narrative that will change the very being of all who let it. The table baya and singing bowls, the simple but atmospheric scenery, everything made this extraordinary and effective. You have to see this. The actors are very kind and were willing to interact backstage afterwards. Thank you to everyone who made this play happen! 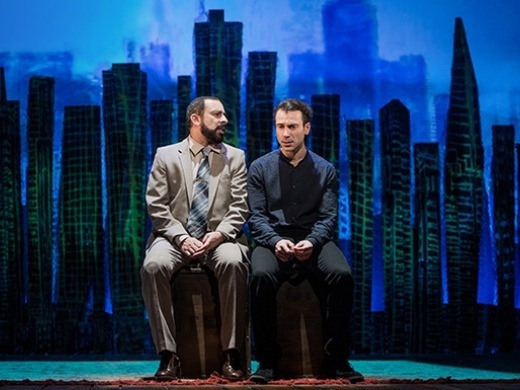 "Giles Croft’s beautifully measured production does full justice to the play’s many moods, creating particularly lyrical images of the kites"
"The Kite Runner offers a tantalising glimpse into a country of extremes and confusing beauty. 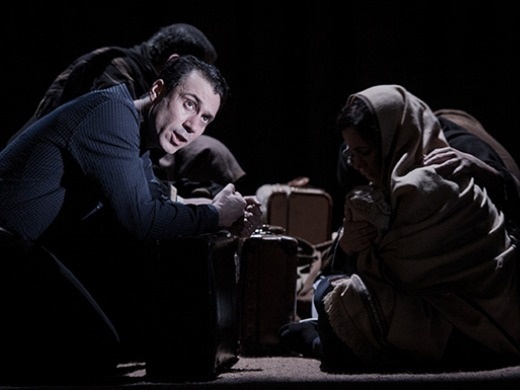 Ben Turner’s central performance is solid and touching, and Nicholas Karimi’s disturbing portral of Assef is remarkable." "the best page-to-stage show since War Horse", "a spellbinding production"
"a faithful and moving production"